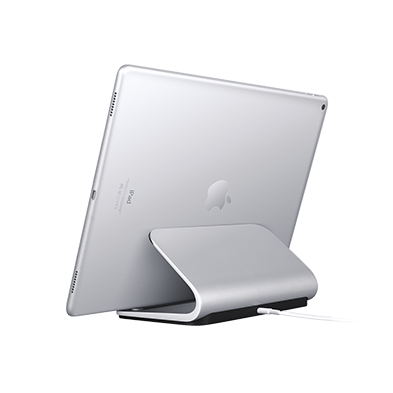 Wireless charging with iPhone® was meant to be a magical experience—not a flat, finicky pad. But you don’t have to take it lying down. 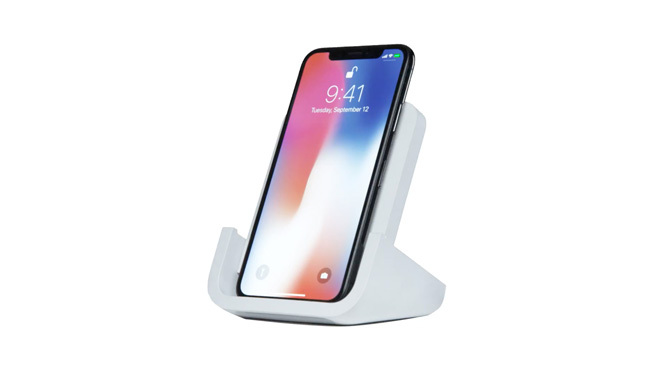 Stand up with POWERED for iPhone, the only wireless charging stand that lives up to the magic of iPhone. Charge or use? Now you can do both at the same time. Effortlessly send messages, watch movies, FaceTime® and more without ever cutting power. 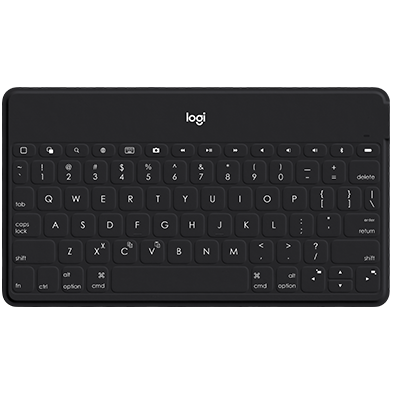 Logitech has over 35 years of experience designing quality products to our exacting Swiss standards. Rigorously tested to ensure the highest levels of precision and safety, POWERED has been engineered to be the first wireless charger truly worthy of iPhone. iPhone has a beautiful screen—so why hide it on a flat charging pad? 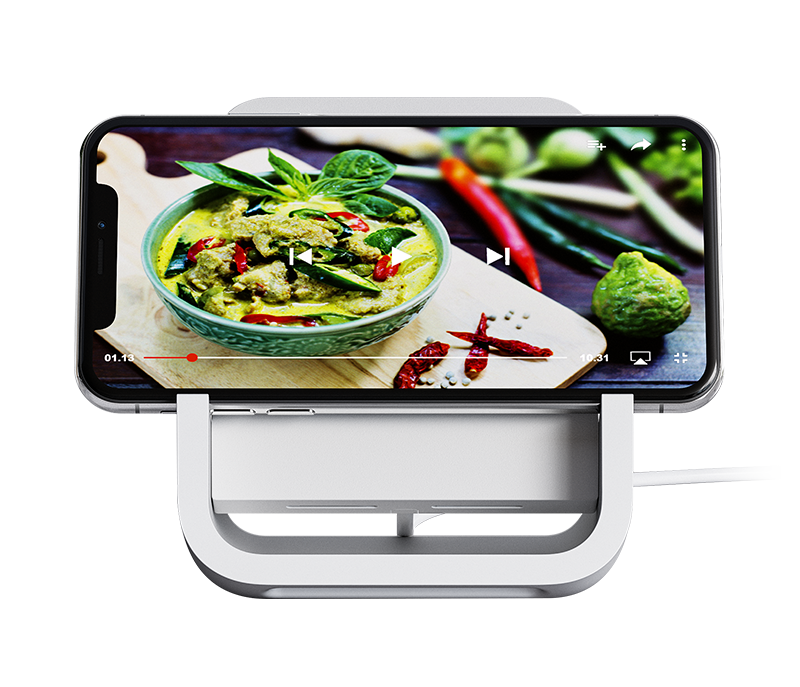 POWERED supports charging in both landscape and portrait modes, resting your phone’s screen at the perfect angle for watching movies, writing notes, and any other app or activity. Wireless charging should be simple and intuitive, not a game of “find the coils.” The U-shaped cradle ensures perfect phone placement every time. Just drop inside the cradle and go—POWERED takes care of the rest. One look is all it takes. 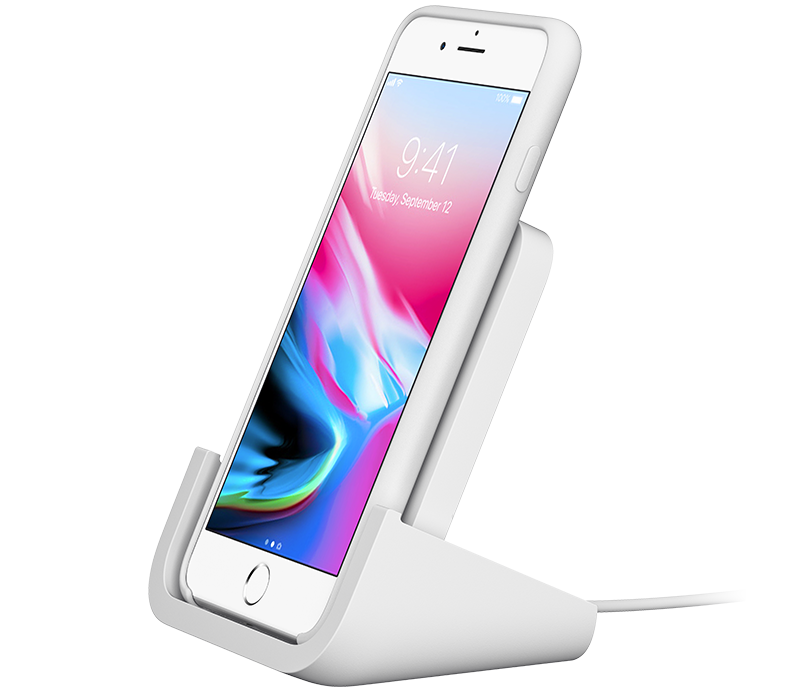 POWERED holds all iPhone X models at a 65° that’s optimal angle for Face ID®, so you can unlock and access notifications with a glance—no need to ever lift a finger. Need to answer emails in the bedroom, read recipes in the kitchen, and watch movies in the bathroom? You got it. A small physical footprint allows POWERED to easily fit (and make a stylish addition to) any room in your home. Enjoy safe, silent charging. 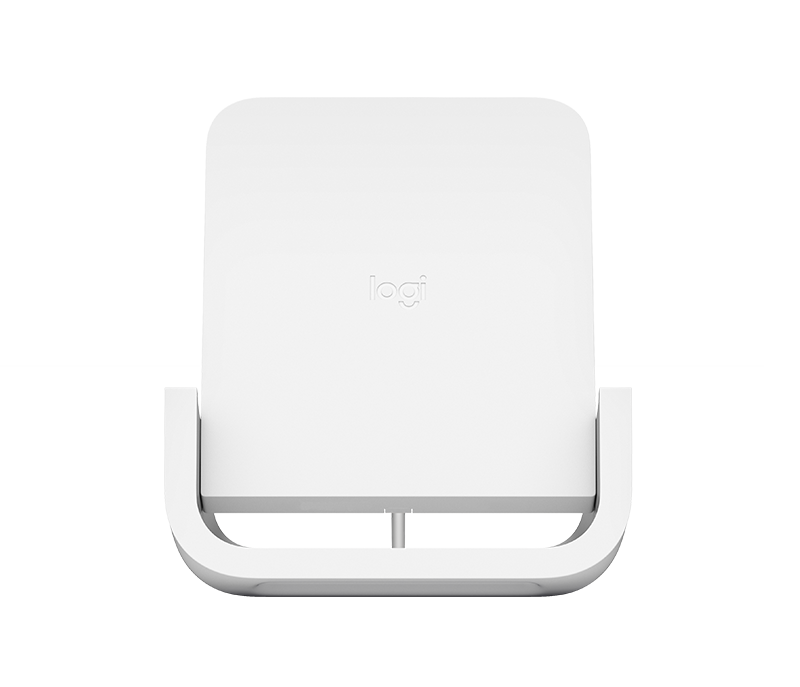 POWERED utilizes internal heat sensors to intelligently manage temperature and prevent overheating. If temperatures start to rise too high, a cool-down process kicks in automatically, eliminating the need for noisy fans. The U-shaped cradle keeps iPhone securely in place at all times. A rubberized surface eliminates the risk of phones falling during alert vibrations—no matter how many times mom calls. Is the light glowing? Then you’re charging. 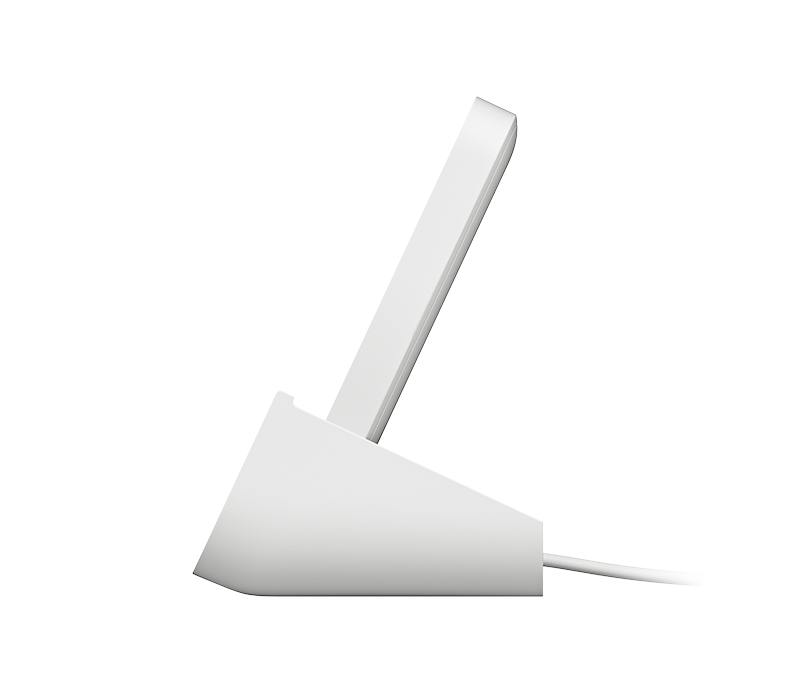 The charging indicator light is designed not to shine too brightly or disturb sleep. If a foreign metal object is detected that might interfere with charging, POWERED will blink to alert you. Not just for iPhone. POWERED delivers up to 5W charging to Qi Certified phones that share similar dimensions and coil configuration to iPhone. POWERED works with non-metal cases up to 3mm thick that don’t contain magnetic parts. Apple silicon and leather cases are compatible. iPhone 8 Plus requires case with a fully open bottom. 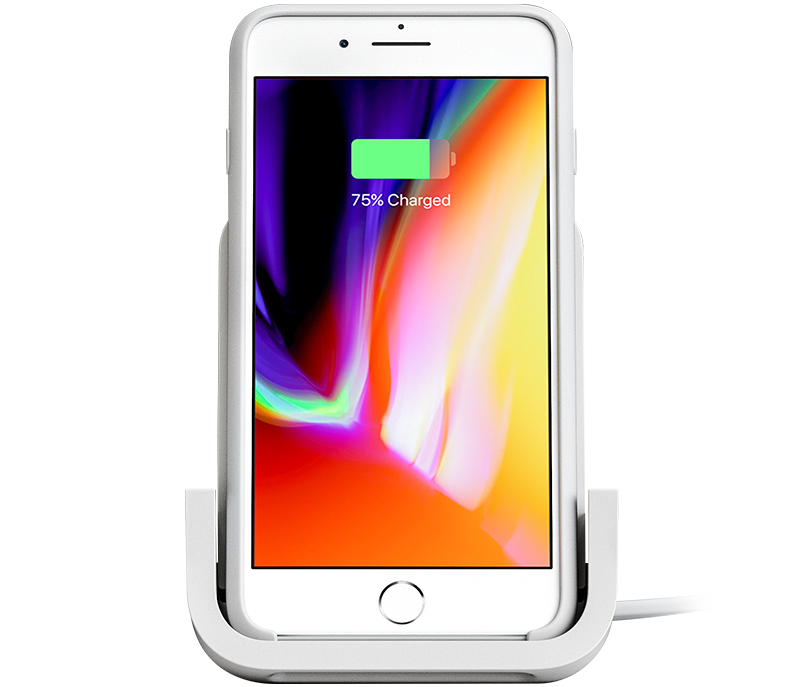 Powered delivers up to 7.5W charging for iPhone 8 and above. For all other Qi-enabled devices, up to 5W charging.